Strengthening his ability as an effective advocate for Northern Illinois University and the flourishing agricultural economy in DeKalb, Kane and Boone Counties, State Representative Jeff Keicher, R-Sycamore, is excited to have been appointed to serve on both the Higher Education-Appropriations Committee and the Agriculture & Conservation Committee, respectively. 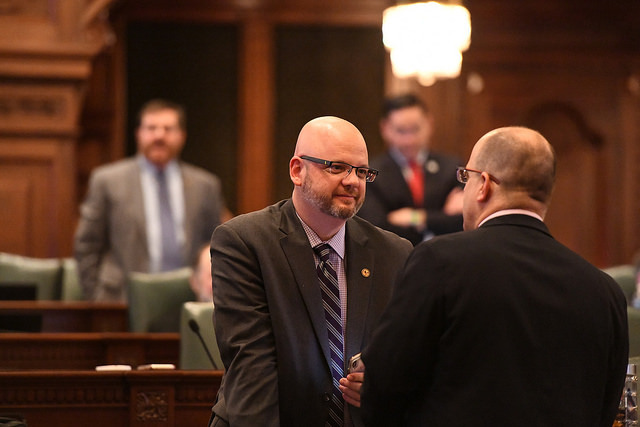 Committee assignments for the 101st General Assembly were announced today as the Illinois House of Representatives prepares to reconvene on Tuesday, February 5. In addition to the Agriculture and Higher Education Appropriations, Representative Keicher has been appointed to serve on the committees for Human Services, Mental Health, and State Government Administration. “I am eager to get to work at the committee level where a lot of the heavy lifting that helps those we are there to serve starts. To begin crafting bipartisan solutions that will strengthen the state’s investment in NIU and our community colleges in 2019 and beyond, support our local ag industry, and make Illinois a national leader in the area of mental health, I’m upbeat and thrilled to get going,” Keicher said. In a gesture to acknowledge and highlight the importance of agriculture to our state and local economy from the very beginning, Representative Keicher selected Dayton Farms in Sycamore as the location for his July 2018 swearing-in ceremony when appointed to fill the unexpired term of former Representative Bob Pritchard, R-Hinckley. Dayton Farm has been in the Ward Family for 183 years.